The Superman Fan Podcast: Episode #172: Superman Comics Cover Dated September 1958: Superman #124 & Action Comics #244! 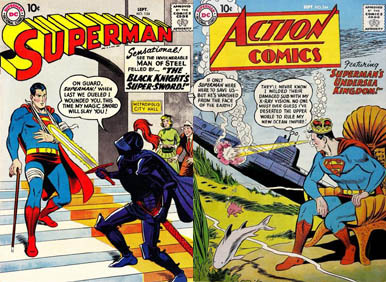 Episode #172: Superman Comics Cover Dated September 1958: Superman #124 & Action Comics #244! Superman 124 & Action Comics 244! Now that we've finished our time at MegaCon 2011, it's once again time to don our indestructible capes, fly by our own powers through the timestream and explore the silver age of Superman stories. SUPERMAN 124, September 1958, was published around July 24, 1958. It contained 32 pages for the cover price of 10 cents. Mort Weisinger was the editor, and the cover was pencilled by Curt Swan and inked by Stan Kaye. All three stories were eight pages long. - THE SUPER SWORD was written by Jerry Coleman and drawn by Al Plastino. - MRS. SUPERMAN was written by Otto Binder and drawn by Kurt Schaffenberger. - THE STEEPLEJACK OF STEEL was written by Otto Binder, pencilled by Wayne Boring and inked by Stan Kaye. ACTION COMICS 244, September 1958, was published around July 31, 1958. It also contained 32 pages for a dime. Mort Weisinger was the editor, and the cover was pencilled by Curt Swan and inked by Stan Kaye. - The 12 page Superman story was THE SUPER MERMAN OF THE SEA, written by Otto Binder, pencilled by Curt Swan and inked by Stan Kaye. - THE RIDDLE OF THE ROC, starring Congo Bill, written by Jack Miller and drawn by Howard Sherman. - THE MYSTERY OF THE THREE SPACE ROOKIES, starring Tommy Tomorrow, written by Otto Binder and drawn by Jim Mooney. Next Episode: SUPERMAN FAMILY OF COMICS COVER DATED JULY/AUGUST 1955: SUPERMAN'S PAL JIMMY OLSEN 6 & WORLD'S FINEST COMICS 77. In two weeks: SUPERMAN COMIC BOOK COVER DATED OCTOBER 1958: ACTION COMICS 245. SUPERMAN 125 would not be published for another month, and would carry the November 1958 cover date.